Canned salmon is another handy pantry staple! Rinse and drain the black beans. Whisk the orange juice with the olive oil, and marinate the black beans in the vinaigrette. If you made extra marinated beans when you made quinoa salad, you can use whatever you have and just take them out of the fridge. Halve, pit, peel, and dice the avocado. 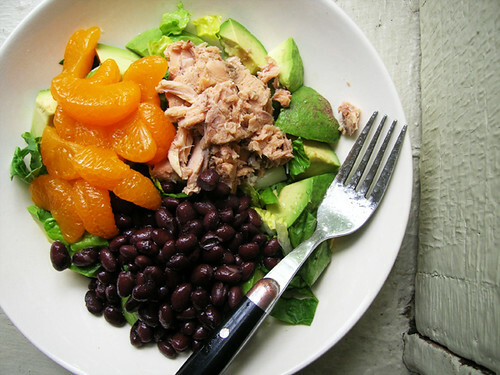 Make a bed of avocado and baby spinach, then top with salmon, marinated black beans, and mandarin oranges.